U.S. Closes Jerusalem Consulate That Gave Palestinians A Link To Washington Rather than using two separate diplomatic missions to deal with Israelis and Palestinians, the U.S. will now have one. The U.S. diplomatic presence in Jerusalem dates to 1844. The State Department says it has shut down the Consulate General Jerusalem, a key conduit to Palestinian leaders. 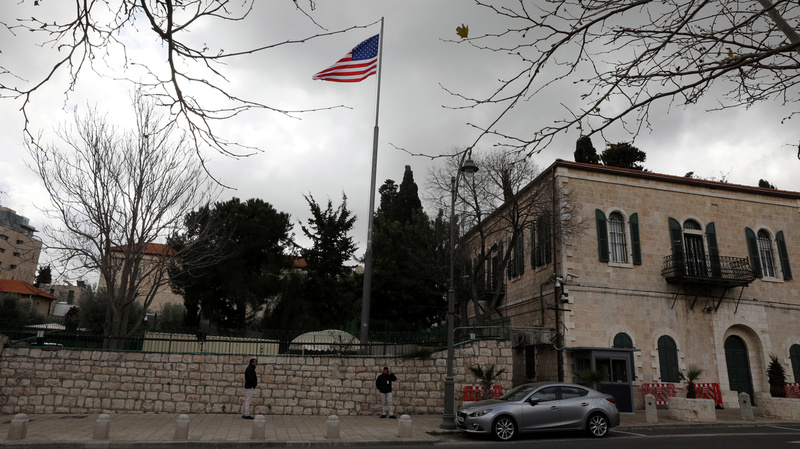 The consulate, seen here on Monday, will merge its duties into the new U.S. Embassy in Jerusalem to form a single diplomatic mission. The U.S. officially shut down its Jerusalem Consulate General on Monday, severing a connection that for decades served as a direct link between Palestinians and Washington. The consulate's work is being folded into the new U.S. Embassy in Jerusalem — a move Palestinian officials have condemned. The long-running consulate is being replaced by a Palestinian Affairs Unit that will operate in the same historic complex on Gerson Agron Street, several miles north of the embassy that opened last year to fanfare and controversy. Rather than using two separate diplomatic missions to deal with Israelis and Palestinians, the U.S. will now have one, in a change that was first unveiled by Secretary of State Mike Pompeo last October. The U.S. says the move is being made for efficiency's sake. But Palestinians and their advocates say that shutting down the consulate will make it more difficult to get a full sense of what's happening in East Jerusalem, the West Bank and Gaza. Even more important, they say, it signals that the U.S. is set on dealing primarily with Israel, with Palestinians demoted to lesser standing. The impact could go even further. Criticizing the move in an article for the Brookings Institution, Middle East experts Ilan Goldenberg and Hady Amr write that the arrangement suggests the U.S. "is no longer truly pursuing a two-state solution and will treat the Israelis and Palestinians as a single political entity instead of two." Then there's the question of how one diplomatic entity will communicate with two separate populations and leadership groups. As NPR's Daniel Estrin recently reported, "[U.S.] Ambassador to Israel David Friedman, a longtime supporter of Israel's West Bank settler movement whom Palestinians see as their ideological opponent, will oversee diplomatic relations with the Palestinians and Israelis both." The U.S. diplomatic presence in Jerusalem dates to 1844, more than 100 years before the nation of Israel was established in 1948. The Agron Street mansion was designated a consulate general in 1928. Decades later, the U.S. opened its embassy complex in Tel Aviv. The merging of diplomatic missions "does not signal a change of U.S. policy on Jerusalem, the West Bank, or the Gaza Strip," State Department Deputy Spokesperson Robert Palladino said on Sunday. He insisted that the U.S. "continues to take no position on final status issues, including boundaries or borders," adding that the specific boundaries of Israel are subject to final negotiations. As part of the switch, Consul General Karen Sasahara, who had been serving as America's de facto ambassador to the Palestinians by leading the independent mission, will leave Jerusalem. The change was quickly reflected on Twitter, where the Jerusalem consulate's Twitter account was deleted Monday morning. In its place, the Palestinian Affairs Unit posted a note from Friedman, thanking Sasahara for her service and wishing her "Godspeed as you move on to represent the United States in another diplomatic mission."